The ethics committee of the Russia parliament votes to oust opposition member after his participation in the the Freedom House forum in the United States. The ethics commission of the Russian State Duma has recommended that Duma Deputy Dmitry Gudkov give up his seat in the legislative body. The commission’s decision to advise Gudkov to leave the Duma was unanimous. Other deputies recommended that Gudkov be denied the right to address parliament for a month rather than being removed from the body. Although the committee cited “repeated violations of ethical norms and defamation of the Russian parliament” as justification for their action, many observers believe the move is punishment for Gudkov’s behavior during a recent visit to the United States. Gudkov visited the U.S. in early March and spoke at a forum organized by Freedom House, which was attended by members of the U.S. Senate. In his speech, Gudkov criticized some Russian government policies, expressed support for the Magnitsky Act and asked U.S. officials for their support in the search for undeclared owned by Russian officials in the U.S.
Last week representatives of all four parties represented in the State Duma declared Gudkov’s speech an insult and asked the Duma’s ethics commission to evaluate it. In their letter to the commission, the party representatives said that Gudkov’s speech was “strongly anti-Russian and meant to discredit the county,” moreover it had not been sanctioned by either the State Duma or the Just Russia party, of which he had at the time been a member. Since the visit, Gudkov has been expelled from Just Russia, along with his father Gennady, who was kicked out of the Duma in September. 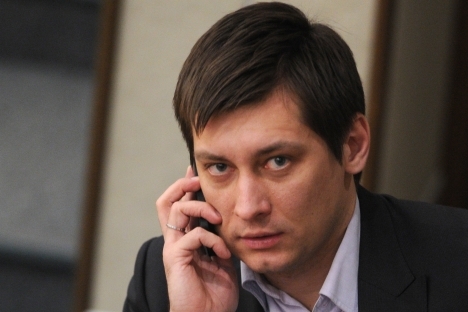 Dmitry Gudkov, for his part, has refused to leave the Duma voluntarily. The article is abridged and first published in Russian in Kommersant Daily.